"Madoff" redirects here. For other people with the same surname, see Madoff (surname). For the miniseries, see Madoff (miniseries). Bernard Lawrence "Bernie" Madoff (/ˈmeɪdɒf/; born April 29, 1938) is an American fraudster and a former stockbroker, investment advisor, and financier. He is the former non-executive chairman of the NASDAQ stock market, and the admitted operator of a Ponzi scheme that is considered the largest financial fraud in U.S. history. Madoff founded the Wall Street firm Bernard L. Madoff Investment Securities LLC in 1960, and was its chairman until his arrest on December 11, 2008. The firm was one of the top market maker businesses on Wall Street, which bypassed "specialist" firms by directly executing orders over the counter from retail brokers. He employed at the firm his brother Peter, as Senior Managing Director and Chief Compliance Officer; Peter's daughter Shana Madoff, as the firm's rules and compliance officer and attorney; and his sons Andrew and Mark. Peter has since been sentenced to 10 years in prison and Mark committed suicide by hanging exactly two years after his father's arrest. Andrew died of lymphoma on September 3, 2014. On December 10, 2008, Madoff's sons told authorities that their father had confessed to them that the asset management unit of his firm was a massive Ponzi scheme, and quoted him as describing it as "one big lie". The following day, FBI agents arrested Madoff and charged him with one count of securities fraud. The U.S. Securities and Exchange Commission (SEC) had previously conducted multiple investigations into Madoff's business practices, but had not uncovered the massive fraud. On March 12, 2009, Madoff pleaded guilty to 11 federal felonies and admitted to turning his wealth management business into a massive Ponzi scheme. The Madoff investment scandal defrauded thousands of investors of billions of dollars. Madoff said he began the Ponzi scheme in the early 1990s. However, federal investigators believe the fraud began as early as the mid-1980s and may have begun as far back as the 1970s. Those charged with recovering the missing money believe the investment operation may never have been legitimate. The amount missing from client accounts, including fabricated gains, was almost $65 billion. The Securities Investor Protection Corporation (SIPC) trustee estimated actual losses to investors of $18 billion. On June 29, 2009, Madoff was sentenced to 150 years in prison, the maximum allowed. Madoff was born on April 29, 1938, in Queens, New York, the son of Jewish parents Ralph Madoff (June 1910 – July 1972), a plumber and stockbroker, and Sylvia Muntner (December 1911 – December 1974). Madoff's grandparents were emigrants from Poland, Romania, and Austria. He is the second of three children; his siblings are Sondra Weiner and Peter Madoff. Madoff graduated from Far Rockaway High School in 1956. He attended the University of Alabama for one year, where he became a brother of the Tau Chapter of the Sigma Alpha Mu fraternity, then transferred to and graduated from Hofstra University in 1960 with a Bachelor of Arts in political science. Madoff briefly attended Brooklyn Law School, but founded the Wall Street firm Bernard L. Madoff Investment Securities LLC and remained working for his own company. Madoff was chairman of Bernard L. Madoff Investment Securities LLC from its startup in 1960 until his arrest on December 11, 2008. The firm started as a penny stock trader with $5,000 ($40,000 today) that Madoff earned from working as a lifeguard and sprinkler installer. He further secured a loan of $50,000 from his father-in-law which he also used to set up Bernard L. Madoff Investment Securities LLC. His business grew with the assistance of his father-in-law, accountant Saul Alpern, who referred a circle of friends and their families. Initially, the firm made markets (quoted bid and ask prices) via the National Quotation Bureau's Pink Sheets. In order to compete with firms that were members of the New York Stock Exchange trading on the stock exchange's floor, his firm began using innovative computer information technology to disseminate its quotes. After a trial run, the technology that the firm helped to develop became the NASDAQ. The firm functioned as a third-market provider, bypassing exchange specialist firms by directly executing orders over the counter from retail brokers. At one point, Madoff Securities was the largest market maker at the NASDAQ, and in 2008 was the sixth-largest market maker on Wall Street. The firm also had an investment management and advisory division, which it did not publicize, that was the focus of the fraud investigation. If your girlfriend goes to buy stockings at a supermarket, the racks that display those stockings are usually paid for by the company that manufactured the stockings. Order flow is an issue that attracted a lot of attention but is grossly overrated. Madoff was active in the National Association of Securities Dealers (NASD), a self-regulatory securities industry organization and served as its Chairman of the Board of Directors and on its Board of Governors. From 1991 to 2008, Bernie and Ruth Madoff contributed about $240,000 to federal candidates, parties and committees, including $25,000 a year from 2005 through 2008 to the Democratic Senatorial Campaign Committee. The Committee returned $100,000 of the Madoffs' contributions to Irving Picard, the bankruptcy trustee who oversees all claims, and Senator Charles E. Schumer returned almost $30,000 received from Madoff and his relatives to the trustee. Senator Christopher J. Dodd donated $1,500 to the Elie Wiesel Foundation for Humanity, a Madoff victim. Members of the Madoff family have served as leaders of the Securities Industry and Financial Markets Association (SIFMA), the primary securities industry organization. Bernard Madoff served on the Board of Directors of the Securities Industry Association, a precursor of SIFMA, and was Chairman of its Trading Committee. He was a founding board member of the DTCC subsidiary in London, the International Securities Clearing Corporation. Madoff's brother Peter served two terms as a member of SIFMA's Board of Directors. He and Andrew received awards from SIFMA in 2008 for "extraordinary leadership and service". He resigned from the Board of Directors of SIFMA in December 2008, as news of the Ponzi scheme broke. From 2000-08, the Madoffs brothers donated $56,000 directly to SIFMA, and paid additional money as sponsors of industry meetings. Bernard Madoff's niece Shana Madoff was a member of the Executive Committee of SIFMA's Compliance & Legal Division, but resigned shortly after the arrest. Madoff's name first came up in a fraud investigation in 1992, when two people complained to the SEC about investments they made with a firm called Avellino & Bienes. Madoff returned the money to investors and the SEC closed the case. In 2004, Genevievette Walker-Lightfoot, a lawyer in the SEC's Office of Compliance Inspections and Examinations (OCIE), informed her supervisor branch chief Mark Donohue that her review of Madoff found numerous inconsistencies, and recommended further questioning. However, she was told by Donohue and his boss Eric Swanson to stop work on the Madoff investigation, send them her work results, and instead investigate the mutual fund industry. Swanson, Assistant Director of the SEC's OCIE, had met Shana Madoff in 2003 while investigating her uncle Bernie Madoff and his firm. The investigation was concluded in 2005. In 2006 Swanson left the SEC and became engaged to Shana Madoff, and in 2007 the two married. A spokesman for Swanson said he "did not participate in any inquiry of Bernard Madoff Securities or its affiliates while involved in a relationship" with Shana Madoff. I was astonished. They never even looked at my stock records. If investigators had checked with The Depository Trust Company, a central securities depository, it would've been easy for them to see. If you're looking at a Ponzi scheme, it's the first thing you do. Madoff said in the June 17, 2009, interview that SEC Chairman Mary Schapiro was a "dear friend", and SEC Commissioner Elisse Walter was a "terrific lady" whom he knew "pretty well". After Madoff's arrest, the SEC was criticized for its lack of financial expertise and lack of due diligence, despite having received complaints from Harry Markopolos and others for almost a decade. The SEC's Inspector General, Kotz, found that since 1992, there had been six investigations of Madoff by the SEC, which were botched either through incompetent staff work or by neglecting allegations of financial experts and whistle-blowers. At least some of the SEC investigators doubted whether Madoff was even trading. Due to concerns of improper conduct by Inspector General Kotz in the Madoff investigation, Inspector General David C. Williams of the U.S. Postal Service was brought in to conduct an independent outside review. The Williams Report questioned Kotz's work on the Madoff investigation, because Kotz was a "very good friend" with Markopolos. Investigators were not able to determine when Kotz and Markopolos became friends. A violation of the ethics rule would have taken place if the friendship were concurrent with Kotz's investigation of Madoff. In 1999, financial analyst Harry Markopolos had informed the SEC that he believed it was legally and mathematically impossible to achieve the gains Madoff claimed to deliver. According to Markopolos, he knew within five minutes that Madoff's numbers did not add up, and it took him four hours of failed attempts to replicate them to conclude that Madoff was a fraud. He was ignored by the SEC's Boston office in 2000 and 2001, as well as by Meaghan Cheung at the SEC's New York office in 2005 and 2007 when he presented further evidence. He has since published a book, No One Would Listen, about the frustrating efforts he and his team made over a ten-year period to alert the government, the industry, and the press about Madoff's fraud. Although Madoff's wealth management business ultimately grew into a multibillion-dollar operation, none of the major derivatives firms traded with him because they did not believe his numbers were real. None of the major Wall Street firms invested with him, and several high-ranking executives at those firms suspected his operations and claims were not legitimate. Others also contended it was inconceivable that the growing volume of Madoff's accounts could be competently and legitimately serviced by his documented accounting/auditing firm, a three-person firm with only one active accountant. The Central Bank of Ireland failed to spot Madoff's gigantic fraud, when he started using Irish funds and had to supply large amounts of information which would have been enough to enable Irish regulators to uncover the fraud much earlier than late 2008 when he was finally arrested in New York. The Federal Bureau of Investigation report and federal prosecutors' complaint says that during the first week of December 2008, Madoff confided to a senior employee, identified by Bloomberg News as one of his sons, that he said he was struggling to meet $7 billion in redemptions. According to the sons, Madoff told Mark Madoff on December 9 that he planned to pay out $173 million in bonuses two months early. Madoff said that "he had recently made profits through business operations, and that now was a good time to distribute it." Mark told Andrew Madoff, and the next morning they went to their father's apartment and asked him how he could pay bonuses to his staff if he was having trouble paying clients. With Ruth Madoff nearby, Madoff told them he was "finished," that he had "absolutely nothing" left, and that his investment fund was "just one big lie" and "basically, a giant Ponzi scheme." According to their attorney, Madoff's sons then reported their father to federal authorities. On December 11, 2008, he was arrested and charged with securities fraud. Madoff posted $10 million bail in December 2008 and remained under 24-hour monitoring and house arrest in his Upper East Side penthouse apartment until March 12, 2009, when Judge Denny Chin revoked his bail and remanded him to the Metropolitan Correctional Center. Chin ruled that Madoff was a flight risk because of his age, his wealth, and the prospect of spending the rest of his life in prison. Prosecutors filed two asset forfeiture pleadings which include lists of valuable real and personal property as well as financial interests and entities owned or controlled by Madoff. Madoff's lawyer, Ira Sorkin, filed an appeal, which prosecutors opposed. On March 20, 2009, an appellate court denied Madoff's request to be released from jail and returned to home confinement until his sentencing on June 29, 2009. On June 22, 2009, Sorkin hand-delivered a customary pre-sentencing letter to the judge requesting a sentence of 12 years, because of tables from the Social Security Administration that his life span was predicted to be 13 years. On June 26, 2009, Chin ordered forfeiture of $170 million in Madoff's assets. Prosecutors asked Chin to sentence Madoff to the maximum 150 years in prison. Bankruptcy Trustee Irving Picard indicated that "Mr. Madoff has not provided meaningful cooperation or assistance." In settlement with federal prosecutors, Madoff's wife Ruth agreed to forfeit her claim to US$85 million in assets, leaving her with $2.5 million in cash. The order allowed the SEC and Court appointed trustee Irving Picard to pursue Ruth Madoff's funds. Massachusetts regulators also accused her of withdrawing $15 million from company-related accounts shortly before he confessed. In February 2009, Madoff reached an agreement with the SEC, banning him from the securities industry for life. Picard sued Madoff's sons, Mark and Andrew, his brother Peter, and Peter's daughter, Shana, for negligence and breach of fiduciary duty, for $198 million. The defendants had received over $80 million in compensation since 2001. According to the SEC indictment against Annette Bongiorno and Joann Crupi, two back office workers who worked for Madoff, they created false trading reports based on the returns that Madoff ordered for each customer. For example, when Madoff determined a customer's return, one of the back office workers would enter a false trade report with a previous date and then enter a false closing trade in the amount required to produce the required profit, according to the indictment. Prosecutors allege that Bongiorno used a computer program specially designed to backdate trades and manipulate account statements. They quote her as writing to a manager in the early 1990s "I need the ability to give any settlement date I want." In some cases, returns were allegedly determined before the account was even opened. Madoff admitted during his March 2009 guilty plea that the essence of his scheme was to deposit client money into a Chase account, rather than invest it and generate steady returns as clients had believed. When clients wanted their money, "I used the money in the Chase Manhattan bank account that belonged to them or other clients to pay the requested funds," he told the court. Madoff used his family name to obtain investments from within the Jewish community. Affected Jewish charitable institutions considered victims of affinity fraud include Hadassah, the Women's Zionist Organization of America, the Elie Wiesel Foundation and Steven Spielberg's Wunderkinder Foundation. Jewish federations and hospitals lost millions of dollars, forcing some organizations to close. The Lappin Foundation, for instance, was forced to close temporarily because it had invested its funds with Madoff. Madoff also dealt with James Harris Simons. David Sheehan, chief counsel to trustee Picard, stated on September 27, 2009, that about $36 billion was invested into the scam, returning $18 billion to investors, with $18 billion missing. About half of Madoff's investors were "net winners," earning more than their investment. The withdrawal amounts in the final six years were subject to "clawback" (return of money) lawsuits. In a May 4, 2011, statement, trustee Picard said that the total fictitious amounts owed to customers (with some adjustments) were $57 billion, of which $17.3 billion was actually invested by customers. $7.6 billion has been recovered, but pending lawsuits, only $2.6 billion is available to repay victims. If all the recovered funds are returned to victims, their net loss would be under $10 billion. The Internal Revenue Service ruled that investors' capital losses in this and other fraudulent investment schemes will be treated as business losses, thereby allowing the victims to claim them as net operating losses to reduce tax liability more easily. The size of the fraud was stated as $65 billion early in the investigation. Former SEC Chairman Harvey Pitt estimated the actual net fraud to be between $10 and $17 billion. One difference between the estimates concerns the method of calculation. One method calculates losses as the total amount that victims thought they were owed, but will never receive. The smaller estimates use a different method, subtracting the total cash received from the scheme from the total cash paid into the scheme, after excluding from the calculation persons accused of collaborating with the scheme, persons who invested through "feeder funds," and anyone who received more cash from the scheme than they paid in. Erin Arvedlund, who publicly questioned Madoff's reported investment performance in 2001, stated that the actual amount of the fraud might never be known, but was likely between $12 and $20 billion. Jeffry Picower, rather than Madoff, appears to have been the largest beneficiary of Madoff's Ponzi scheme, and his estate settled the claims against it for $7.2 billion. Entities and individuals affiliated with Fred Wilpon and Saul Katz received $300 million in respect of investments in the scheme. Wilpon and Katz "categorically reject[ed]" the charge that they "ignored warning signs" about Madoff's fraud. On March 12, 2009, Madoff pleaded guilty to 11 federal felonies, including securities fraud, wire fraud, mail fraud, money laundering, making false statements, perjury, theft from an employee benefit plan, and making false filings with the SEC. The plea was the response to a criminal complaint filed two days earlier, which stated that over the past 20 years, Madoff had defrauded his clients of almost $65 billion in the largest Ponzi scheme in history. Madoff insisted he was solely responsible for the fraud. Madoff did not plea bargain with the government. Rather, he pleaded guilty to all charges. It has been speculated that Madoff pleaded guilty instead of cooperating with the authorities in order to avoid naming any associates and co-conspirators who were involved with him in the scheme. In November 2009, David G. Friehling, Madoff's accounting front man and auditor, pleaded guilty to securities fraud, investment adviser fraud, making false filings to the SEC, and obstructing the IRS. Friehling extensively cooperated with federal prosecutors and testified at the trials of five former Madoff employees, all of whom were convicted and sentenced to between 2½ and 10 years in prison. Although he could have been sentenced to more than 100 years in prison, because of his cooperation, Friehling was sentenced in May 2015 to one year of home detention and one year of supervised release. Madoff's right-hand man and financial chief, Frank DiPascali, pleaded guilty to 10 federal charges in 2009 and (like Friehling) testified for the government at the trial of five former colleagues, all of whom were convicted. DiPascali faced a sentence of up to 125 years, but he died of lung cancer in May 2015, before he could be sentenced. In his plea allocution, Madoff stated he began his Ponzi scheme in 1991. He admitted he had never made any legitimate investments with his clients' money during this time. Instead, he said, he simply deposited the money into his personal business account at Chase Manhattan Bank. When his customers asked for withdrawals, he paid them out of the Chase account — a classic "robbing Peter to pay Paul" scenario. Chase and its successor, JPMorgan Chase, may have earned as much as $483 million from his bank account. He was committed to satisfying his clients' expectations of high returns, despite an economic recession. He admitted to false trading activities masked by foreign transfers and false SEC filings. He stated that he always intended to resume legitimate trading activity, but it proved "difficult, and ultimately impossible" to reconcile his client accounts. In the end, Madoff said, he realized that his scam would eventually be exposed. On June 29, 2009, Judge Chin sentenced Madoff to the maximum sentence of 150 years in federal prison. Madoff's lawyers initially asked the judge to impose a sentence of 7 years, and later requested that the sentence be 12 years, because of Madoff's advanced age of 71 and his limited life expectancy. I have left a legacy of shame, as some of my victims have pointed out, to my family and my grandchildren. This is something I will live in for the rest of my life. I'm sorry. He added, "I know that doesn't help you," after his victims recommended to the judge that he receive a life sentence. Judge Chin had not received any mitigating factor letters from friends or family testifying to Madoff's good deeds. "The absence of such support is telling," he said. Judge Chin also said that Madoff had not been forthcoming about his crimes. "I have a sense Mr. Madoff has not done all that he could do or told all that he knows," said Chin, calling the fraud "extraordinarily evil", "unprecedented", and "staggering", and that the sentence would deter others from committing similar frauds. Judge Chin also agreed with prosecutors' contention that the fraud began at some point in the 1980s. He also noted that Madoff's crimes were "off the charts" since federal sentencing guidelines for fraud only go up to $400 million in losses. Ruth did not attend court but issued a statement, saying "I am breaking my silence now because my reluctance to speak has been interpreted as indifference or lack of sympathy for the victims of my husband Bernie's crime, which is exactly the opposite of the truth. I am embarrassed and ashamed. Like everyone else, I feel betrayed and confused. The man who committed this horrible fraud is not the man whom I have known for all these years." Madoff's attorney asked the judge to recommend that the Federal Bureau of Prisons place Madoff in the Federal Correctional Institution, Otisville, which is located 70 miles (110 km) from Manhattan. The judge, however, only recommended that Madoff be sent to a facility in the Northeast United States. Madoff was transferred to the Federal Correctional Institution Butner Medium near Butner, North Carolina, about 45 miles (72 km) northwest of Raleigh; he is Bureau of Prisons Register #61727-054. Jeff Gammage of the Philadelphia Inquirer said "Madoff's heavy sentence likely determined his fate." Madoff's projected release date is November 14, 2139. The release date, described as "academic" in Madoff's case because he would have to live to the age of 201, reflects a reduction for good behavior. On October 13, 2009, it was reported that Madoff experienced his first prison yard fight with another inmate, also a senior citizen. When he began his sentence, Madoff's stress levels were so severe that he broke out in hives and other skin maladies soon after. On December 18, 2009, Madoff was moved to Duke University Medical Center in Durham, North Carolina, and was treated for several facial injuries. A former inmate later claimed that the injuries were received during an alleged altercation with another inmate. Other news reports described Madoff's injuries as more serious and including "facial fractures, broken ribs, and a collapsed lung". The Federal Bureau of Prisons said Madoff signed an affidavit on December 24, 2009, which indicated that he had not been assaulted and that he had been admitted to the hospital for hypertension. In his letter to his daughter-in-law, Madoff said that he was being treated in prison like a "Mafia don". They call me either Uncle Bernie or Mr. Madoff. I can't walk anywhere without someone shouting their greetings and encouragement, to keep my spirit up. It's really quite sweet, how concerned everyone is about my well being, including the staff […] It's much safer here than walking the streets of New York. On November 28, 1959, Madoff married Ruth Alpern, whom he had met while attending Far Rockaway High School. The two eventually began dating. Ruth graduated high school in 1958 and earned her bachelor's degree at Queens College, she was employed at the stock market in Manhattan before working in Madoff's firm, and she founded the Madoff Charitable Foundation. Bernard and Ruth Madoff had two sons: Mark (March 11, 1964 – December 11, 2010), a 1986 graduate of the University of Michigan, and Andrew (April 8, 1966 – September 3, 2014), a 1988 graduate of University of Pennsylvania's Wharton Business School. Both sons later worked in the trading section alongside paternal cousin Charles Weiner. Several family members worked for Madoff. His younger brother, Peter, an attorney, was Senior Managing Director and Chief Compliance Officer, and Peter's daughter, Shana Madoff, also an attorney, was the firm's compliance attorney. On the morning of December 11, 2010 — exactly two years after Bernard's arrest — his son Mark was found dead in his New York City apartment. The city medical examiner ruled the cause of death as suicide by hanging. Mark Madoff owed his parents $22 million, and Andrew Madoff owed them $9.5 million. There were two loans in 2008 from Bernard Madoff to Andrew: $4.3 million on October 6, and $250,000 on September 21. Andrew owned a Manhattan apartment and a home in Greenwich, Connecticut, as did his brother prior to Mark's death. Following a divorce from his first wife in 2000, Mark withdrew money from an account. Both sons used outside investment firms to run their own private philanthropic foundations. In March 2003, Andrew Madoff was diagnosed with mantle cell lymphoma and eventually returned to work. He was named Chairman of the Lymphoma Research Foundation in January 2008, but resigned shortly after his father's arrest. Peter Madoff (and Andrew Madoff, before his death) remained the targets of a tax fraud investigation by federal prosecutors, according to The Wall Street Journal. David Friehling, Bernard Madoff's tax accountant, who pleaded guilty in a related case, is reportedly assisting in the investigation. According to a civil lawsuit filed in October 2009, trustee Irving Picard alleges that Peter Madoff deposited $32,146 into his Madoff accounts and withdrew over $16 million; Andrew deposited almost $1 million into his accounts and withdrew $17 million; Mark deposited $745,482 and withdrew $18.1 million. Bernie Madoff lived in Roslyn, New York, in a ranch house through the 1970s. After 1980 he owned an ocean-front residence in Montauk. His primary residence was on Manhattan's Upper East Side, and he was listed as chairman of the building's co-op board. He also owned a home in France and a mansion in Palm Beach, Florida, where he was a member of the Palm Beach Country Club. Madoff owned a 55-foot (17 m) sportfishing yacht named Bull. All three homes were auctioned by the U.S. Marshals Service in September 2009. Sheryl Weinstein, former chief financial officer of Hadassah, disclosed in a memoir that she and Madoff had had an affair more than 20 years earlier. As of 1997, when Weinstein left, Hadassah had invested a total of $40 million. By the end of 2008, Hadassah had withdrawn more than $130 million from its Madoff accounts and contends its accounts were valued at $90 million at the time of Madoff's arrest. At the victim impact sentencing hearing, Weinstein testified, calling him a "beast". According to a March 13, 2009, filing by Madoff, he and his wife were worth up to $126 million, plus an estimated $700 million for the value of his business interest in Bernard L. Madoff Investment Securities LLC. Other major assets included securities ($45 million), cash ($17 million), half-interest in BLM Air Charter ($12 million), a 2006 Leopard yacht ($7 million), jewelry ($2.6 million), Manhattan apartment ($7 million), Montauk home ($3 million), Palm Beach home ($11 million), Cap d' Antibes, France property ($1 million), and furniture, household goods, and art ($9.9 million). During a 2011 interview on CBS, Ruth Madoff claimed she and her husband had attempted suicide after his fraud was exposed, both taking "a bunch of pills" in a suicide pact on Christmas Eve 2008. In November 2011, former Madoff employee David Kugel pleaded guilty to charges that arose out of the scheme. He admitted having helped Madoff create a phony paper trail, the false account statements that were supplied to clients. Bernie Madoff suffered a heart attack in December 2013, and reportedly suffers from end-stage renal disease (ESRD). According to CBS New York and other news sources, Madoff claimed in an email to CNBC in January 2014 that he has kidney cancer but this is unconfirmed. Madoff was a prominent philanthropist, who served on boards of nonprofit institutions, many of which entrusted his firm with their endowments. The collapse and freeze of his personal assets and those of his firm affected businesses, charities, and foundations around the world, including the Chais Family Foundation, the Robert I. Lappin Charitable Foundation, the Picower Foundation, and the JEHT Foundation which were forced to close. Madoff donated approximately $6 million to lymphoma research after his son Andrew was diagnosed with the disease. He and his wife gave over $230,000 to political causes since 1991, with the bulk going to the Democratic Party. Madoff served as the Chairman of the Board of Directors of the Sy Syms School of Business at Yeshiva University, and as Treasurer of its Board of Trustees. He resigned his position at Yeshiva University after his arrest. Madoff also served on the Board of New York City Center, a member of New York City's Cultural Institutions Group (CIG). He served on the executive council of the Wall Street division of the UJA Foundation of New York which declined to invest funds with him because of the conflict of interest. Madoff undertook charity work for the Gift of Life Bone Marrow Foundation and made philanthropic gifts through the Madoff Family Foundation, a $19 million private foundation, which he managed along with his wife. They donated money to hospitals and theaters. The foundation has also contributed to many educational, cultural, and health charities, including those later forced to close because of Madoff's fraud. After Madoff's arrest, the assets of the Madoff Family Foundation were frozen by a federal court. The systemic problems exposed in the Madoff prosecution have not improved remedies for fraud victims. Indeed, since the exposure, it has become far harder for a fraud victim to prevail. In 2009, the Supreme Court required a plaintiff to establish his claim before any disclosure is required by the defendant. Labels and conclusions" and "a formulaic recitation of the elements of a cause of action" will not suffice. Thus, correct statements about fraud, when not supported by appropriate documentation, will lead to a dismissal of the claim. Without supporting documents demonstrating the truth of the allegations, the culprit is presumed to be telling the truth and the victim to be lying or mistaken, as occurred here with Madoff. Imagining Madoff is a 2010 play by Deb Margolin that tells the story of an imagined encounter between Madoff and his victims. The play generated controversy when Elie Wiesel, originally portrayed as a character in the play, threatened legal action, forcing Margolin to substitute a fictional character, “Solomon Galkin.” The play was nominated for a 2012 Helen Hayes Award. A documentary, Chasing Madoff, describing Harry Markopolos' efforts to unmask the fraud, was released in August 2011. Woody Allen's 2013 film Blue Jasmine portrays a fictional couple involved in a similar scandal. HBO is making a movie about Madoff in which actor Robert De Niro is set to star, based on the best-selling book The Wizard of Lies, by Diana B. Henriques. On August 28, 2015 it was announced that Michelle Pfeiffer will be playing Ruth Madoff. Madoff, a miniseries by ABC starring Richard Dreyfuss and Blythe Danner as Bernie and Ruth Madoff, aired on February 3 and 4, 2016. ↑ "Voice of America pronunciation guide". Voice of America. Retrieved March 18, 2010. ↑ "Ex-Nasdaq chair arrested for securities fraud". CNN Money. December 12, 2008. Retrieved October 19, 2013. 1 2 "Wife Says She and Madoff Tried Suicide". The New York Times. Reuters. October 26, 2011. Retrieved May 23, 2013. ↑ "The Madoff Case: A Timeline". The Wall Street Journal. March 6, 2009. Retrieved March 6, 2009. ↑ Henriques, Diana (January 13, 2009). "New Description of Timing on Madoff's Confession". The New York Times. Retrieved January 19, 2009. 1 2 Lieberman, David; Pallavi Gogoi; Theresa Howard; Kevin McCoy; Matt Krantz (December 15, 2008). "Investors remain amazed over Madoff's sudden downfall". USA Today. Retrieved December 24, 2008. 1 2 O'Hara, Maureen (1995). Market Microstructure Theory. Oxford: Blackwell. p. 190. ISBN 1-55786-443-8. Retrieved December 16, 2008. ↑ "Peter Madoff Sentenced to 10 Years for Role in Ponzi Scheme". NBC News. Retrieved August 13, 2013. 1 2 "Madoff son's suicide follows battle with trustee". MSNBC. December 13, 2010. Retrieved March 11, 2013. 1 2 3 4 Voreacos, David; Glovin, David (December 13, 2008). "Madoff Confessed $50 Billion Fraud Before FBI Arrest". Bloomberg News. ↑ "SEC: Complaint SEC against Madoff and BMIS LLC" (PDF). U.S. Securities and Exchange Commission. December 11, 2008. Retrieved December 29, 2008. 1 2 3 4 5 6 7 Appelbaum, Binyamin; Hilzenrath, David S.; Paley, Amit R. (December 13, 2008). "'All Just One Big Lie'". The Washington Post. p. D01. Retrieved December 12, 2008. ↑ Kolker, Carlyn; Kary, Tiffany; Kishan, Saijel (December 23, 2008). "Madoff Victims May Have to Return Profits, Principal". Bloomberg News. Retrieved December 24, 2008. 1 2 3 Safer, Morley (September 27, 2009). "The Madoff Scam: Meet The Liquidator". 60 Minutes. CBS News. pp. 1–4. Retrieved September 28, 2009. ↑ McCool, Grant; Martha Graybow (March 13, 2009). "Madoff pleads guilty, is jailed for $65 billion fraud". Reuters. Retrieved September 19, 2013. 1 2 "Bernard Madoff gets 150 years behind bars for fraud scheme". CBC News. June 29, 2009. Archived from the original on July 2, 2009. Retrieved June 29, 2009. ↑ Healy, Jack (June 29, 2009). "Madoff Sentenced to 150 Years for Ponzi Scheme". The New York Times. Retrieved June 29, 2009. ↑ Varchaver, Nicholas (January 16, 2009). "Madoff's mother tangled with the feds". cnn.com. Retrieved March 11, 2013. ↑ "Social Security Death Index". ancestry.com. Retrieved March 11, 2013. ↑ Who's Who In America – 1996 (50 ed.). Marquis Who's Who. 1995. ↑ Lauria, Joe (March 22, 2009). "Life inside the weird world of Bernard Madoff". Timesonline. London. Retrieved March 28, 2009. ↑ Bandler, James; Varchaver, Nicholas (April 24, 2009). "How Bernie Mandoff pulled off his massive swindle". CNNMoney.com. Retrieved June 25, 2009. ↑ "Report: Madoff's Sister Among Scammed Victims". Fox News. January 2009. Retrieved April 16, 2011. 1 2 Oppenheimer, Jerry (2009). Madoff with the Money. Wiley. p. 280. ISBN 0-470-50498-6. . "Ruth, who grew up in Laurelton, Queens, with Bernie became his steady at Far Rockaway High School. She had attributes that intrigued Bernie: She had a “shiksa” look, but was Jewish; she was social and outgoing; she had a shrewd accountant father, and she was a whiz at one particular subject – math – all the right stuff for a future Master of the Universe in the gilded canyons of Wall Street. Married in 1959, Bernie would later cheat on her like he cheated his clients." ↑ John Carney. "The Education of Bernie Madoff: The High School Years". Clusterstock. Retrieved December 25, 2008. ↑ Allen Salkin (January 18, 2009). "Bernie Madoff, Frat Brother". The New York Times. Retrieved May 12, 2009. ↑ Salkin, Allen (January 16, 2009). "Bernie Madoff, Frat Brother". The New York Times. Retrieved January 20, 2009. ↑ 10 Thing You Didn't Know About Bernard Madoff. US News and World Report. Retrieved August 6, 2011. ↑ "The Talented Mr. Madoff". New York Times. January 24, 2009. Retrieved April 15, 2011. ↑ "10 Things You Didn't Know About Bernard Madoff". US News. March 12, 2009. Retrieved April 15, 2011. 1 2 "The Madoff files: Bernie's billions". The Independent. London. March 29, 2009. Retrieved January 29, 2009. ↑ Madoff's tactics date to 1960s, when father-in-law was recruiter | Business Features | Jerusalem Post Archived June 15, 2011, at the Wayback Machine. 1 2 3 de la Merced, Michael J. (December 24, 2008). "Effort Under Way to Sell Madoff Unit". The New York Times. Retrieved December 24, 2008. ↑ Weiner, Eric J. (2005). What Goes Up: The Uncensored History of Modern Wall Street as Told by the Bankers, Brokers, CEOs, and Scoundrels who Made it Happen. Little, Brown and Company. pp. 188–192. ISBN 0-316-92966-2. ↑ "SEC Charges Bernard L. Madoff for Multi-Billion Dollar Ponzi Scheme (2008–293)". SEC.gov. U.S. Securities and Exchange Commission. December 11, 2008. Retrieved December 11, 2008. ↑ Wilhelm, William J.; Joseph D. Downing (2001). Information Markets: What Businesses Can Learn from Financial Innovation. Harvard Business Press. p. 153. ISBN 1-57851-278-6. Retrieved March 13, 2009. ↑ Princeton University Undergraduate Task Force (January 2005). "THE REGULATION OF PUBLICLY TRADED SECURITIES" (PDF). U.S. Securities and Exchange Commission. p. 58. Retrieved December 17, 2008. ↑ Ferrell, Allen (2001). "A Proposal for Solving the "Payment for Order Flow" Problem" (PDF). 74 S.Cal.L.Rev. 1027. Harvard. Retrieved December 12, 2008. ↑ Battalio, Robert H.; Tim Loughran (January 15, 2007). "Does Payment for Order Flow to Your Broker Help or Hurt You?" (PDF). Notre Dame University. Retrieved December 12, 2008. 1 2 McMillan, Alex (May 29, 2000). "Q&A: Madoff Talks Trading". CNN. Retrieved December 11, 2008. ↑ Henriques, Diana B. (January 13, 2009). "New Description of Timing on Madoff's Confession". The New York Times. Retrieved January 19, 2009. ↑ Becker, Bernie (March 26, 2009). "Money From Madoff Is Rerouted". The New York Times. Retrieved March 29, 2009. 1 2 Williamson, Elizabeth; Kara Scannell (December 18, 2008). "Family Filled Posts at Industry Groups". The Wall Street Journal. Retrieved November 3, 2009. ↑ "The Owner's Name is on the Door". Bernard L. Madoff Investment Securities, LLC. Archived from the original on December 14, 2008. Retrieved November 3, 2009. ↑ Brian Ross. The Madoff Chronicles: Inside the Secret World of Bernie and Ruth. Retrieved March 11, 2013. ↑ Deborah Hart Strober; Gerald Strober; Gerald S. Strober. Catastrophe: The Story of Bernard L. Madoff, the Man Who Swindled the World. Retrieved March 11, 2013. ↑ Robert A. Schwartz, John Aidan Byrne & Antoinette Colaninno (June 24, 2005). Coping With Institutional Order Flow. Retrieved March 11, 2013. ↑ "SIFMA Honors Industry Professionals with Distinguished Leadership and Chairmen's Achievement Awards". Sifma. November 8, 2006. Retrieved March 11, 2013. ↑ Williamson, Elizabeth (December 22, 2008). "Shana Madoff's Ties to Uncle Probed". The Wall Street Journal. Retrieved March 1, 2009. ↑ Madoff, Shana. "San Francisco Topical Breakfast". Compliance and Legal Division of the Securities Industry and Financial Markets Association. Retrieved March 1, 2009. ↑ Zachary A. Goldfarb, Staffer at SEC Had Warned Of Madoff; Lawyer Raised Alarm, Then Was Pointed Elsewhere, The Washington Post, July 2, 2009. ↑ Investigation of Failure of the SEC to Uncover Bernard Madoff's Ponzi Scheme... Retrieved March 11, 2013. ↑ Labaton, Stephen (December 16, 2008). "Unlikely Player Pulled Into Madoff Swirl". The New York Times. ↑ Ross, Bryan & Rhee, Joseph (December 16, 2008). "SEC Official Married into Madoff Family". ABC News. 1 2 Kouwe, Zachery; Peter Edmonston (June 23, 2009). "Madoff Lawyers Seek Leniency in Sentencing". The New York Times. Retrieved September 12, 2009. ↑ Gendar, Alison (October 31, 2009). "Bernie Madoff baffled by SEC blunders; compares agency's bumbling actions to Lt. Colombo". Daily News. New York. Retrieved March 16, 2010. 1 2 Hipwell, Deirdre (December 12, 2008). "Wall Street legend Bernard Madoff arrested over '$50 billion Ponzi scheme'". The Times. London, UK. Retrieved December 13, 2008. ↑ "Report of Investigation Executive Summary" (PDF). Retrieved March 16, 2010. ↑ House Committee Financial Services, Investigations of Madoff Fraud Allegations, Part 1 C-Span. Retrieved February 4, 2016. ↑ Schmidt, Robert; Gallu, Joshua (January 25, 2013). "SEC Said to Back Hire of U.S. Capitol Police Inspector General". Bloomberg L.P. Retrieved October 15, 2015. 1 2 Schmidt, Robert; Joshua Gallu (October 26, 2012). "Former SEC Watchdog Kotz Violated Ethics Rules, Review Finds". Bloomberg. Retrieved February 10, 2013. ↑ "David Kotz, Ex-SEC Inspector General, May Have Had Conflicts Of Interest". Huffington Post. October 5, 2012. Retrieved February 10, 2013. ↑ Sarah N. Lynch (November 15, 2012). "David Weber Lawsuit: Ex-SEC Investigator Accused Of Wanting To Carry A Gun At Work, Suing For $20 Million". Huffingtonpost.com. Retrieved February 10, 2013. 1 2 "The Man Who Figured Out Madoff's Scheme". CBS News. February 27, 2009. ↑ Fitzgerald, Jim. Madoff's financial empire audited by tiny firm: one guy. Associated Press via Seattle Times, December 18, 2008. ↑ I4U News. "Bernard Madoff". Retrieved September 26, 2014. ↑ "Today in the press - Taiwan Sun". Retrieved September 26, 2014. 1 2 Margolick, David (July 2009). "The Madoff Chronicles, Part III: Did the Sons Know". Vanity Fair. Retrieved June 25, 2009. 1 2 "Transcript of Madoff guilty plea hearing" (PDF). Retrieved March 18, 2010. 1 2 "Bail Pending Sentencing" (PDF). Retrieved March 18, 2010. ↑ "Madoff Letter Seeking Leniency". Scribd.com. February 18, 2010. Retrieved March 18, 2010. ↑ "Government's Sentencing Memorandum 06/26/2009" (PDF). Retrieved March 18, 2010. ↑ "Madoff to Forfeit $170 Billion In Assets Ahead of Sentencing". Washingtonpost.com. June 27, 2009. Retrieved March 18, 2010. ↑ Henriques, Diana B., "Prosecutors propose 150-year sentence for Madoff". The New York Times, June 26, 2009. 1 2 Efrati, Amir; Robert Frank (June 28, 2009). "Madoff's Wife Cedes Asset Claim". The Wall Street Journal. Retrieved September 12, 2009. ↑ Arends, Brent (June 29, 2009). "Ruth Faces Living Off a Scant $2.5 Million". The Wall Street Journal. Retrieved September 12, 2009. ↑ "Madoff's wife crying all the way to the bank". Digital Journal. June 30, 2009. Retrieved September 12, 2009. ↑ Jones, Ashby (February 9, 2009). "Madoff Makes Peace with the SEC, Amount of Fine TBD". The Wall Street Journal. Retrieved March 29, 2009. ↑ Safer, Morley (September 27, 2009). "The Madoff Scam: Meet The Liquidator". 60 Minutes. CBS News. p. 2. Retrieved September 28, 2009. ↑ "Trustee: Madoff firm was family's piggy bank". msnbc.com. Associated Press. May 13, 2009. Retrieved September 12, 2009. 1 2 Hays, Tom (November 18, 2010). "2 Madoff employees charged with helping former boss' scam". USA Today. Associated Press. Retrieved May 22, 2013. 1 2 Steinert-Threlkeld, Tom (November 18, 2010). "Women of the House of Madoff". Securities Technology Monitor. Retrieved November 19, 2010. ↑ Stempel, Jonathan (December 2, 2010). "Madoff trustee sues JPMorgan for $6.4 billion". Reuters. Retrieved December 2, 2010. ↑ "Madoff's Victims". The Wall Street Journal. March 6, 2009. Retrieved December 31, 2011. ↑ Tyler Durden (May 15, 2009). "Is There More Than Meets The Eye At RenTec?". Zero Hedge. 1 2 Irving H. Picard, Trustee, Bernard L. Madoff Investment Securities LLC Liquidation Proceeding, TRUSTEE FOR LIQUIDATION OF BERNARD L. MADOFF INVESTMENT SECURITIES FILES MOTION TO ALLOCATE RECOVERED MONIES TO THE BLMIS CUSTOMER FUND AND RETURN STOLEN FUNDS TO CUSTOMERS, May 4, 2011. Retrieved May 18, 2011. ↑ Anderson (December 11, 2008). "Bill Analysis SENATE GOVERNANCE & FINANCE COMMITTEE Senator Lois Wolk, Chair FRAUDULENT INVESTMENTS". Leginfo.public.ca.gov. Retrieved March 11, 2013. ↑ Hays, Tom; Larry Neumeister; Shlomo Shamir (March 6, 2009). "Extent of Madoff fraud now estimated at far below $50b". Haaretz. Associated Press. Retrieved March 7, 2009. ↑ Arvedlund, Erin E. (May 7, 2001). "Don't Ask, Don't Tell – Bernie Madoff is so secretive, he even asks investors to keep mum". Barron's. Retrieved August 12, 2009. ↑ Arvedlund, Erin (2009). Too Good to Be True: The Rise and Fall of Bernie Madoff. Penguin Group. ISBN 978-1-59184-287-3. ↑ Arvedlund, Erin (2009). Madoff, The Man who stole $65 Billion. Penguin Group. ISBN 978-0-141-04546-7. ↑ Bernstein, Jake (June 28, 2009). "Madoff may not have benefited most in scam Client Jeffry Picower allegedly withdrew $5.1 billion from accounts". Pro Publica. Retrieved December 18, 2010. ↑ Healy, Beth; Casey Ross (December 18, 2010). "Picower estate adds $7.2b to Madoff fund". Boston Globe. Retrieved December 18, 2010. ↑ Madoff Trustee: Mets Owners Ignored Ponzi Warning Signs, Chad Bray, The Wall Street Journal, February 4, 2011. Retrieved February 4, 2011. ↑ Bray, Chad (March 12, 2009). "Madoff Pleads Guilty to Massive Fraud". The Wall Street Journal. Retrieved March 12, 2009. ↑ Glovin, David; Larson, Erik; Voreacos, David (March 10, 2009). "Madoff to Plead Guilty in Largest US Ponzi Scheme". Bloomberg.com. Retrieved March 10, 2009. ↑ "Bernard Madoff Will Plead Guilty to 11 Charges in Financial Fraud Case, Faces 150 Years in Prison". Fox News. March 10, 2009. Retrieved March 10, 2009. ↑ Dienst, Jonathan (October 30, 2009). "Madoff Accountant Set to Make a Deal". NBC New York. Retrieved March 16, 2010. ↑ Matthew Goldstein, "Madoff Accountant Avoids Prison Term", New York Times, May 29, 2015. Retrieved February 4, 2016. ↑ Erik Larson, Frank DiPascali, Madoff Deputy Who Aided U.S., Dies at 58, Bloomberg Business] (May 10, 2015). ↑ Stephanie Yang, "Former Madoff Aide Frank DiPascali Dies at Age 58 of Lung Cancer", Wall Street Journal, May 11, 2015. ↑ Ishmael, Stacy-Marie (August 26, 2009). "How much money did JPMorgan make on Madoff?". Financial Times. Retrieved August 28, 2009. ↑ Davis, Lou; Wilson, Linus (January 28, 2010). "Estimating JP Morgan Chase's Profits from the Madoff Deposits". Social Science Research Network. SSRN 1460706 . ↑ "Plea Allocution of Bernard Madoff (US v. Bernard Madoff)". FindLaw. March 12, 2009. Retrieved March 12, 2009. ↑ "Fraudster Madoff gets 150 years". BBC News. June 29, 2009. Retrieved June 29, 2009. ↑ "Bernie Madoff sounds off in emails from jail: 'I wish I hadn't pled guilty'". Daily Mail. London, UK. February 15, 2013. ↑ "USA v Beranrd L. Madoff" (PDF). Justice.gov. Retrieved February 4, 2016. ↑ Zambito, Thomas; Martinez, Jose; Siemaszko, Corky (June 29, 2009). "Bye, Bye Bernie: Ponzi king Madoff sentenced to 150 years". New York Daily News. Retrieved September 12, 2009. ↑ Zuckerman, Gregory; Jones, Ashby; Copeland, Robert; Bray, Chad (June 30, 2009). "'Evil' Madoff Gets 150 Years in Epic Fraud". The Wall Street Journal. Retrieved September 12, 2009. ↑ Murakami Tse, Tomoeh (June 30, 2009). "Madoff Sentenced to 150 Years Calling Ponzi Scheme 'Evil,' Judge Orders Maximum Term". The Washington Post. Retrieved September 24, 2009. ↑ Wordsworth, Araminta (June 29, 2009). "Madoff's wife to keep US$2.5-million in cash". Financial Post. Retrieved September 12, 2009. ↑ Chuchmach, Megan; Esposito, Richard; Katersky, Aaron (July 14, 2009). "Bernie Madoff 'Hit the Inmate Lottery' with Butner Prison, Consultant Says". ABC News. Retrieved July 14, 2009. 1 2 "Bernard Madoff profile, Federal Bureau of Prisons. Retrieved January 5, 2010. ↑ Gammage, Jeff. "Fumo's future in agency's hands." The Philadelphia Inquirer. Tuesday August 4, 2009. Retrieved January 5, 2010. ↑ Kouwe, Zachery (July 14, 2009). "Madoff Arrives at Federal Prison in North Carolina". The New York Times. Associated Press. Retrieved July 14, 2009. ↑ "Madoff moved to prison in Atlanta -US prison record". Reuters. July 14, 2009. Retrieved July 14, 2009. ↑ Calder, Rich (October 13, 2009). "Bernie's bruising battle – over stocks!". NYPOST.com. Retrieved March 16, 2010. 1 2 Mangan, Dan (June 21, 2010). "Madoff's hidden booty". New York Post. Archived from the original on June 23, 2010. ↑ Searcey, Dionne; Efrati, Amir (March 10, 2010). "Madoff Beaten in Prison: Ponzi Schemer Was Assaulted by Another Inmate in December; Officials Deny Incident'". The Wall Street Journal. Retrieved April 3, 2010. 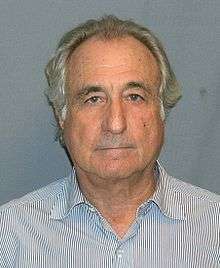 ↑ "Bernie Madoff Brutally Beaten In Prison". Youtube.com. December 24, 2009. Retrieved March 11, 2013. ↑ Drew Sandholm. "Prison Disputes Madoff Beating Story", ABC News. March 18, 2010. Retrieved August 10, 2010. ↑ Rhee, Joseph (October 20, 2011). "'Like a Mafia Don': Bernie Madoff's Boastful Letter to Angry Daughter-in-Law". ABC News. Retrieved March 11, 2013. ↑ "Have pity on Ruth Madoff". CNN, November 14, 2009. Retrieved April 16, 2011. ↑ "Ruth and Bernard Madoff Marriage Profile", About.com. Retrieved February 4, 2016. ↑ "The Trials of Ruth Madoff", People.com, February 21, 2011. Retrieved April 14, 2011. 1 2 3 4 Seal, Mark (April 2009). "Madoff's World". Vanity Fair. Archived from the original on March 21, 2009. Retrieved March 22, 2009. ↑ Lambiet (December 12, 2008). "Bernie Madoff's arrest sent tremors into Palm Beach". Palm Beach Daily. Retrieved December 12, 2008. ↑ "A Charmed Life, a Tragic Death", People.com, January 10, 2011. Retrieved April 15, 2011. "Today would have been Mark's 47th birthday! I will never forget the kind and fun loving person he was. This will always be a difficult day of the year for me." ↑ "Andrew Madoff Son of Convicted Fraudster Dies at 48". The New York Times. Retrieved February 4, 2016. ↑ "The Tale of the Madoff Sons", New York Magazine, June 3, 2009. Retrieved April 15, 2011. ↑ "EXCERPT: Mark Madoff in 'The Madoff Chronicles'", MSNBC.com, December 12, 2010. Retrieved April 15, 2011. ↑ "The Trials of Ruth Madoff", People.com, February 21, 2011. Retrieved April 15, 2011. 1 2 3 4 5 Feuer, Alan; Haughney, Christine (December 13, 2008). "Standing Accused: A Pillar of Finance and Charity". The New York Times. Retrieved April 26, 2010. ↑ "Bernie Madoff's sons and brother investigated". Thefirstpost.co.uk. February 12, 2010. Retrieved March 11, 2013. ↑ "Officials: Bernie Madoff's Son Mark Madoff Found Dead Of Apparent Suicide In Soho Apartment", newyork.cbslocal.com; December 11, 2010. ↑ "Madoff Prosecutors Seek to Take Businesses, Loans". Bloomberg. March 17, 2009. Retrieved March 29, 2009. ↑ "Department of Justice" (PDF). Retrieved March 18, 2010. ↑ "Madoff son found dead of apparent suicide". CNN. December 11, 2010. Retrieved December 11, 2010. ↑ Lucchetti, Aaron; Lauricella, Tom (March 29, 2009). "Sons' Roles in Spotlight". The Wall Street Journal. Retrieved January 23, 2009. ↑ Efrati, Amir (February 11, 2010). "Prosecutors Set Sights on Madoff Kin". The Wall Street Journal. Dow Jones. Retrieved February 11, 2010. ↑ Maier, Kate (December 12, 2008). "Montauk Oceanfront Owner Cited in Ponzi Scheme". East Hampton Star. Retrieved December 23, 2008. ↑ Jagger, Suzy (December 18, 2008). "Bernard Madoff: the 'most hated man in New York' seeks $3 m for bail". The Times. London. Retrieved December 23, 2008. 1 2 Frank, Robert; Lattman, Peter; Searcey, Dionne; Lucucchetti, Aaron (December 13, 2008). "Fund Fraud Hits Big Names; Madoff's Clients Included Mets Owner, GMAC Chairman, Country-Club Recruits". The Wall Street Journal. Retrieved December 13, 2008. ↑ "Madoff's arrest in billion-dollar fraud case shocks Palm Beach investors", Palm Beach Post, December 12, 2008. ↑ Creswell, Julie (January 24, 2009). "The Talented Mr. Madoff". The New York Times. Retrieved January 25, 2009. ↑ Destefano, Anthony (August 14, 2009). "Proposals sought from brokers for sale of Madoff homes". Newsday. Retrieved September 12, 2009. ↑ "Bernard Madoff's personal property to be auctioned". Deccan Herald. October 20, 2009. Retrieved December 8, 2010. ↑ Henriques, Diana; Stephanie Strom (August 13, 2009). "Woman Tells of Affair With Madoff in New Book". The New York Times. Retrieved August 20, 2009. ↑ "abcnews.com". Abcnews.go.com. Retrieved March 18, 2010. ↑ McCool, Grant (March 13, 2009). "Madoff to appeal bail, net worth revealed". Reuters. Retrieved March 13, 2009. ↑ "Fraudster Bernard Madoff and wife 'attempted suicide'". BBC News. October 26, 2011. Retrieved October 27, 2011. ↑ Hilzenrath, David S. (November 22, 2011). "Former Madoff trader David Kugel pleads guilty to fraud". The Washington Post. ↑ Bernie Madoff health crises, Huffingtonpost.com; January 22, 2014. Retrieved January 27, 2014. ↑ "Report: Madoff Battling Cancer, Recovering From Heart Attack". January 22, 2014. Retrieved April 17, 2014. ↑ Natasha Mozgovaya, "Prominent Jewish foundations shut down due to Madoff Wall Street affair". Haaretz. December 15, 2008. 1 2 "Madoff Wall Street fraud threatens Jewish philanthropy". Retrieved December 13, 2008. ↑ Friedman (December 13, 2008). "Charity Caught Up in Wall Street Ponzi Scandal". Fox News. Retrieved December 13, 2008. ↑ Zajac, Andrew; Hook, Janet (December 22, 2008). "Madoff had steady presence in Washington". Los Angeles Times. Retrieved September 12, 2009. ↑ NYCC Board of directors New York City Center. ↑ Moore (December 24, 2008). "A Jewish Charity That Avoided Madoff". The Wall Street Journal. Retrieved December 24, 2008. ↑ Sherwell (December 13, 2008). "Bernie Madoff: Profile of a Wall Street star". London: Telegraph. Retrieved December 14, 2008. ↑ "Woody Allen Takes on the Madoff Scandal in New Movie". the Wall Street Journal. May 30, 2013. Retrieved November 4, 2013. ↑ "In God We Trust - The Movie". The Halcyon Company. Retrieved May 22, 2014. ↑ "Robert De Niro To Play Madoff". Slashfilm.com. May 15, 2011. Retrieved March 11, 2013. ↑ "Richard Dreyfuss: Like It Or Not, There's A Bit Of Bernie Madoff In All Of Us". NPR. January 28, 2016. Retrieved February 4, 2016. ↑ "'Madoff' and 'Scandal': ABC's miniseries probably means a longer wait for Olivia Pope's return | TV By The Numbers by zap2it.com". Tvbythenumbers.zap2it.com. November 13, 2015. Retrieved February 4, 2016. Wikimedia Commons has media related to Bernard Madoff.